As a UNV HIV and AIDS Trainer with the African Union-United Nations Hybrid Operation in Darfur (UNAMID) for the North Darfur Region from February 2013 to 31 March 2015, I contributed to increasing the awareness of the general population and the IDPs in various locations within the region. Darfur, Sudan: Fighting the spread of HIV in war zones and conflict settings is a major challenge facing UN Missions across the globe. The conflict in Darfur has resulted in huge displacements of populations, disruption to family structures and livelihoods, as well as the deterioration of health infrastructures. Additionally, it has led to the creation of camps for internally displaced persons (IDPs) across the region. In general, the spread of HIV/AIDS is exacerbated by conditions of violence and instability that increase the risk of exposure to the disease. Since comprehensive knowledge about HIV/AIDS among the population of Darfur is as low as 9.4%, the HIV and AIDS Unit of the African Union-United Nations Hybrid Operation in Darfur (UNAMID) was up to 30 June 2014 mandated to organize HIV/AIDS outreach activities to support the Sudan National AIDS Control Programmes in Darfur. In North Darfur, with my team we facilitated the construction of three HIV Counselling and Rapid Testing centres benefitting an estimated population of 30,000 people. I was also instrumental in supporting NGOs develop winning project proposals that received funding from UNAMID and successfully monitored progress at various stages of implementation, including the final handing over to the respective beneficiaries. Every year, UNAMIDs HIV and AIDS Unit provides funds to the National AIDS Control Programme Offices in Darfur to carry out outreach activities. It provides an opportunity to reach out to the wider communities and IDPs with messages on HIV/AIDS, as well as on rapid testing services. I was able to facilitate a massive World Aids Day commemoration in 2013, during which 50 Water Rollers/Buckets were distributed to the communities in addition to leaflets and posters on HIV. As part of efforts to fight the spread of HIV in prisons, I facilitated a series of training programmes targeting prison personnel as well as People Living with HIV (PLHIV). They both received adequate information through posters and leaflets, in addition to other forms of support to the PLHIVs specifically. PLHIVs benefitted of Water Rollers to help ease the collection of water whose access is not readily available in most places in the region. A major challenge in fighting HIV and AIDS in conflict situations is the fact that most areas are not reachable either due to poor road networks and/or control of movements by rebels. This makes it extremely difficult to reach out to the wider communities. Moreover, the promotion of condom use is a major challenge in Darfur. Looking ahead, I think that the PLHIVs in Darfur could be involved more in the fight against the spread of HIV/AIDS in order to reduce stigma and discrimination. 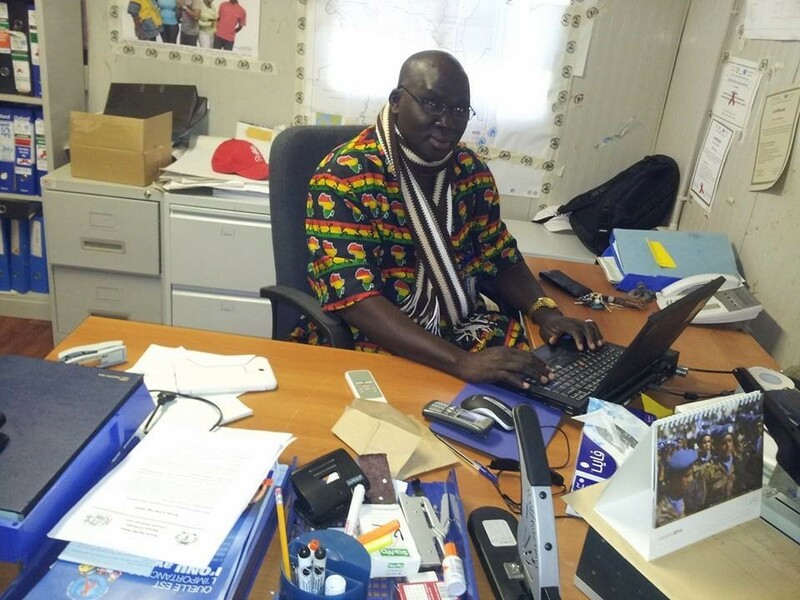 Kebba Jome, from the Gambia, is a UN Volunteer HIV and AIDS Trainer with UNAMID, where he works to fight HIV and AIDS as Team Leader in North Darfur.